Health: Infant mortality rate (2010)—52.84 1,000 live births. Life expectancy (2009 est. )—71.34/62.53 years (women/men). household goods--16.1%; education--8.5%;public administration and defense, social security--6.8%. Branches: Executive--president (chief of state), prime minister (head of government), Council of Ministers (cabinet). Legislative--unicameral National Assembly (parliament).Judicial--Supreme Court, Economic Court, Constitutional Court. Political parties: New Azerbaijan Party, National Revival Party, Azerbaijan Democratic Reforms Party, Civil Solidarity Party, Umid (Hope) Party, Justice Party, Ana Vatan (Motherland) Party, Azerbaijan Social Welfare Party, Citizens’ Union Party, Great Establishment Party, and United Azerbaijani Popular Front Party hold seats in Parliament. The Musavat Party, Azerbaijan Popular Front Party, Liberal Party, Democratic Party, Modern Musavat and others do not hold seats in Parliament. There are more than 40 registered political parties in Azerbaijan and many small, unregistered parties. Natural resources: Petroleum, natural gas, iron ore, nonferrous metals, aluminum. Agriculture: Products--cotton, tobacco, grain, rice, grapes, fruit, vegetables, tea, cattle, sheep, goats. Azerbaijan combines the heritage of two venerable civilizations--the Seljuk Turks of the 11th century and the ancient Persians. Its name is thought to be derived from the Persian phrase "Land of Fire," referring both to its petroleum deposits, known since ancient times, and to its status as a former center of the Zoroastrian faith. The Azerbaijani Republic borders the Iranian provinces of East and West Azerbaijan, which are predominantly populated by ethnic Azeris. Azerbaijan's first parliament was elected in 1995. The present 125-member unicameral parliament was elected in November 2010 in an election that did not meet a number of international standards. 70 elected parliamentarians are from the President's New Azerbaijan Party, 10 are from various other political parties that largely support the President, and 42 claim no party affiliation, but consistently vote with the ruling party. Traditional opposition parties Musavat and the Popular Front are not represented in parliament. The November 2010 parliamentary elections were marred by a deficient candidate registration process, limits on freedom of assembly and expression, a restrictive political environment, unbalanced media coverage of candidates, and problems in vote counting and tabulation. Under the 1995 constitution, the speaker of parliament stands next in line to the President. However, constitutional amendments approved in a flawed process in August 2002 included a provision replacing the speaker of parliament with the prime minister in the line of succession to the presidency. The parliament remains a weak body with little real influence that votes nearly unanimously on all the executive government’s initiatives. The human rights situation in the country remains poor, especially with respect to freedom of assembly, freedom of expression, the administration of justice, and the respect of property rights. In 2011, several political protests calling for democratic reform and the government's resignation were forcefully dispersed and 15 protesters were sentenced to 18 months to three years of incarceration for their participation in such protests. Applications to hold protests in Baku were repeatedly denied throughout the year. Local NGOs have reported forced evictions on dubious eminent domain grounds, inadequate compensation, and unclear property registration regulations. Restrictions on the freedom of religion also remain a problem. Corruption remains pervasive in all aspects of society. Over the past few years, the Government of Azerbaijan has worked to integrate the country into the global economic marketplace, attract increased foreign investment, diversify its economy, and maintain positive growth during the global financial crisis. Wide-ranging economic reforms implemented by Azerbaijan during the past five years have resulted in notable progress to improve regulatory efficiency and encourage domestic economic diversification, especially in the areas of agriculture, tourism, and information and communications technology. In particular, the substantial economic reforms implemented in 2007 and 2008 led the World Bank to name Azerbaijan as one of the top ten global reformers for 2009 in its annual Doing Business report. Azerbaijan has enjoyed measurable success in diversifying its economy outside of the energy sector, with the non-oil portion of the economy growing by almost ten percent in 2011, while energy sector growth was flat. In the past few years, the overall regulatory reform process has slowed in comparison to 2007-2009. While many of the reforms adopted were designed to facilitate Azerbaijan’s accession to the World Trade Organization (WTO), as of March 2012, Azerbaijan still is not a WTO member. Azerbaijan has a liberal exchange rate system and, in general, there are no restrictions on converting or transferring funds associated with an investment into freely usable currency at a legal market-clearing rate. No systematic difficulties exist in obtaining foreign exchange. The official currency reserves of the Central Bank of Azerbaijan, previously the National Bank of Azerbaijan, increased from 6.4 billion USD at the end of 2010 to 10.48 billion USD at the beginning of 2012. Reserves had decreased in 2009 primarily in response to the global financial crisis, which facilitated a decline in hard-currency reserves in Azerbaijan’s commercial banks, prompting the Central Bank of Azerbaijan to expend reserves to maintain the convertibility rate of the Azerbaijani Manat in direct support of the Azerbaijani economy. The average annual inflation rate for 2011 was 8.1 percent (EIU). In March 2011, the Central Bank increased its interest rate to avoid inflation; however, in late 2011, the Central Bank urged commercial banks to decrease their interest rates in order to stimulate non-oil sector growth. In December 2011, Standard & Poor’s upgraded the sovereign credit rating of Azerbaijan to BBB- investment grade and concluded that the rating had a stable outlook. Fitch Ratings affirmed the long-term sovereign rating of investment in foreign and domestic currency for Azerbaijan at BBB- and upgraded the outlook for Azerbaijan from stable to positive in September 2011. Fitch Ratings first assigned Azerbaijan the BBB- rating in May 2010. Additionally, Moody’s Investor Service upgraded the outlook on Azerbaijan’s sovereign rating from stable to positive and confirmed the issuer rating for government debt at Ba1 in March 2011. The State Oil Fund (SOFAZ) – with assets totaling 29.8 billion USD in reserves at the end of 2011 – operates as a sovereign wealth fund for Azerbaijan. It was established in 1999 and reports directly to the President of Azerbaijan through its Executive Director. SOFAZ manages all state revenue from oil and natural gas, and is charged with preserving Azerbaijan’s economic stability, helping diversify the economy, and preserving the nation’s wealth for future generations. Importantly, the higher inflation also reflects customs restrictions that are in place due to supply constraints that limit import competition and to monopolies that continue to control many sectors of the economy. The national currency, the Manat (AZN), is artificially stable and was allowed to appreciate against the dollar by 6.1% in 2005, 5.4% in 2006, 3.4% in 2007, and 1.1% in 2008. By early 2009, one AZN was worth $1.24, an exchange rate that has remained steady ever since, increasing only slightly since late 2010. The 2012 consolidated state budget sets spending at 17.1 billion AZN, an increase of about 5% over 2011. The budget funds an ambitious program of infrastructure investments, focusing on transportation and water and irrigation. About three-quarters of the budget is funded by transfers from SOFAZ and taxes on oil companies. This degree of reliance on hydrocarbon revenues has led the IMF to express concerns about the economy’s stability and vulnerability to inflationary pressures. While a significant drop in oil prices would likely require some curtailment of the government’s investment program, to date, inflationary pressures have been manageable. Azerbaijan is considered one of the most important spots in the world for oil exploration and development. Proven oil reserves in the Caspian Basin, which Azerbaijan shares with Russia, Kazakhstan, Turkmenistan, and Iran, are comparable in size to North Sea reserves several decades ago. The Baku-Tbilisi-Ceyhan (BTC) pipeline, which opened in May 2005, has a maximum capacity of one million barrels per day. While oil and gas production in Azerbaijan has been steady for the past few years, imminent large-scale investments in the oil and gas sector (most notably, a $20 billion investment for the second stage of the Shah Deniz gas project) are likely to cause energy production to climb over the next decade. Negotiations are ongoing over different gas pipeline options for transporting Caspian gas to Southern Europe. Despite substantial progress in stabilizing the economy and reducing poverty over the past few years, substantial medium-to-long term economic challenges for Azerbaijan still remain, particularly with regards to the implementation of institutional and systemic reforms that are critical to strengthening the foundations for economic freedom. 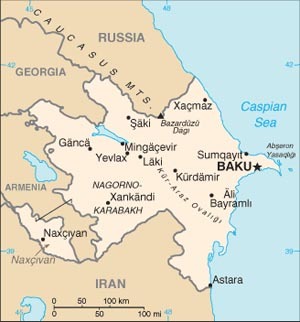 Although Azerbaijan has continued to attract significant foreign investment to further develop its energy sector throughout the past decade, inefficient government bureaucracy, weak legal institutions, requests for illicit payments for cross-border transactions, and predatory behavior by politically connected monopolistic interests continue to hinder investment outside of this sector and present challenges for foreign investors. Azerbaijan is a member of the United Nations, the Organization for Security and Cooperation in Europe (OSCE), NATO's Partnership for Peace, the Euro-Atlantic Partnership, the World Health Organization, the GUAM (Georgia, Ukraine, Azerbaijan, and Moldova) Organization for Democracy and Economic Development, the European Bank for Reconstruction and Development, the Council of Europe, the International Monetary Fund, the Organization of the Islamic Conference, the Nonaligned Movement, and the World Bank. Azerbaijan is an observer at the Community of Democracies. In 2011, Azerbaijan was elected to the UN Security Council as a non-permanent member, representing the East Europe Group for the 2012-2013 term. Since 1997, the Minsk Group Co-Chairs have presented a number of proposals to serve as a framework for resolving the conflict. One side or the other rejected each of those proposals, but negotiations have continued at an intensified pace since 2004. In November 2007, on the margins of the OSCE Ministerial Council in Madrid, the ministerial-level representatives of the three Co-Chair countries presented the sides with a proposal on the “Basic Principles for the peaceful settlement of the Nagorno-Karabakh conflict.” In 2008, Azerbaijani President Aliyev and Armenian President Serzh Sargsian signed a declaration expressing their intent to seek a political settlement to the conflict, to resume confidence-building measures, and to intensify negotiations within the Minsk Group framework on the basis of the Madrid proposal. The Co-Chairs have continued their intensive consultations with the sides to narrow differences on the revised Basic Principles, including through two meetings between the Presidents of Armenia and Azerbaijan in 2011. In a joint statement issued during the December 2011 OSCE Ministerial Council Meeting in Vilnius, Foreign Ministers Mammadyarov and Nalbandian reaffirmed the importance of reaching a peaceful settlement of the Nagorno- Karabakh conflict based on the principles and norms of international law, the United Nations Charter, the Helsinki Final Act, and the previous joint statements by the Presidents of the Minsk Group Co-Chair countries. In a joint statement with Russian President Dmitri Medvedev in Sochi, Russia in January 2012, Presidents Sargsian and Aliyev expressed their readiness to accelerate reaching agreement on the Basic Principles.